On this page, you’ll find how this specific lesson plan, Making a Farm, is aligned to the Common Core Mathematics Standards organized by grade level, domain, and standard ID with in-depth explanations and examples. CCSS.MATH.CONTENT.3.OA.A.3: Students are using the formulas for perimeter and area to build their farm, which as addendum to their house. CCSS.MATH.CONTENT.3.OA.A.4: Students use the formulas for area and perimeter when the length and width have been determined. CCSS.MATH.CONTENT.3.NF.A.3.D: In the lesson about making a farm, students are dealing with fractions that have the same denominator. In this example below, the Perimeter = 38 and Area = 110. Perimeter/Area = 38/110, Dirt/Area = 64/110, and Water/Area =8/110. When the fractions are added together, it equals 110/110, which equals one farm. 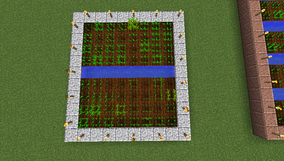 CCSS.MATH.CONTENT.3.MD.B.3: Before students make their farms in Minecraft, they will be using graph paper to sketch out what it will look like to ensure that their design will meet the design requirements. 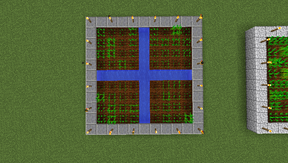 The blocks in Minecraft scale perfectly to the individual squares of the graph paper. CCSS.MATH.CONTENT.3.G.A.2: When constructing their farms, students can partition the area into equal parts (e.g. 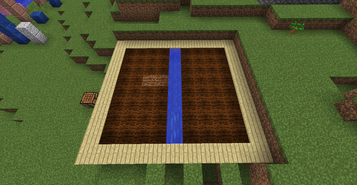 plots of dirt separated by water), and they are challenged to convert the area each component of the farm (perimeter, dirt, water) into a fraction, coming to a realization that they are part of a whole. Here, the farm has been separated into equal parts that make up a whole. CCSS.MATH.CONTENT.4.NF.B.3.A: When sketching the designs of their farms, students must break down each of the components (dirt, water, perimeter enclosing) into fractions. CCSS.MATH.CONTENT.4.NF.B.3.B: After designing their farms, students are tasked with creating fractions for the perimeter, dirt, and water. In this example below, the Perimeter = 40 and Area = 121. Perimeter/Area = 40/121, Dirt/Area = 64/121, and Water/Area =17/21. When the fractions are added together, it equals 121/121, which equals one farm. CCSS.MATH.CONTENT.4.NF.B.3.D: In designing their farm, students are turning parts of the whole into fractions and adding them back together, with like denominators. By building a digital farm, students are using a visual fraction model to learn about the concept. CCSS.MATH.CONTENT.6.G.A.1: This farm is a polygon that is composed of a decomposition of shapes. For example, this farm (belowt) has an area of 110 total blocks. Of the 110 blocks, 38 are in the perimeter enclosure, there are two 4 x 8 areas of dirt, and 1 x 8 area of water. CCSS.MATH.CONTENT.6.EE.A.2.A: In designing their farm, students must solve for the unknown variables of perimeter (P) and area (A).